Chabad House's Giving Day is ON NOW! 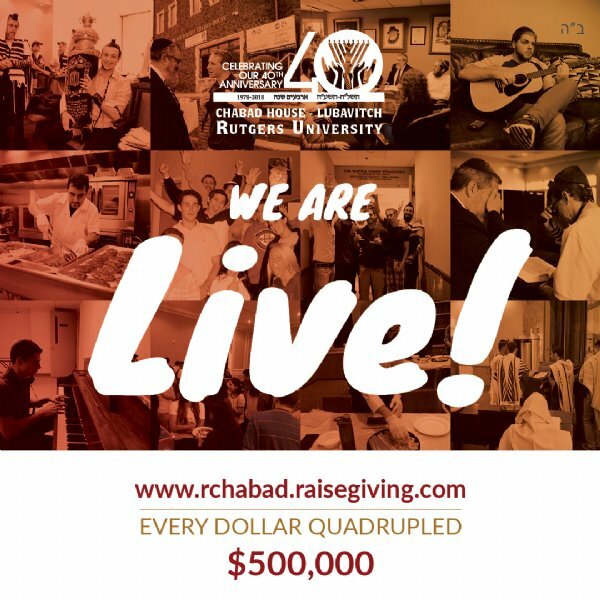 For the next 24 hours there's an unprecedented way for you to contribute to Chabad House at Rutgers University! GO TO https://rchabad.raisegiving.com/ TO PARTICIPATE. THANKS TO OUR GENEROUS MATCHERS YOUR DONATION WILL BE QUADRUPLED UP TO $500,000!!! That means every $1 you contribute turns into $4! Go to https://rchabad.raisegiving.com/ to participate and follow the campaign's progress. Join us in raising $500,000! Every donation is QUADRUPLED! Together It Will Be Done!